If you remember, last week, Jio announced its new ‘Summer Surprise Offer’ that offered free three months of Complementary internet plan that they paid for. For Example, if you recharged with Rs. 303 Plan, you were getting three months of free calling and free 4G Data ( 1GB Limit Per Day). But, today, an exclusive news has been received, and according to that, Jio is withdrawing its Summer Surprise Offer and so, in a few days, the offer will not be there. This information has been received via the Press Release by Jio, and as per that, TRAI (Telecom Regulatory Authority of India) has asked Jio to withdraw its 3-Months Complimentary Offer. And Jio has said that it will comply with the regulator’s direction. Now, if you were one of those guys who purchased the Prime Membership just because of this amazing offer by Jio, then this new news is surely not good for you. But, there is a catch! 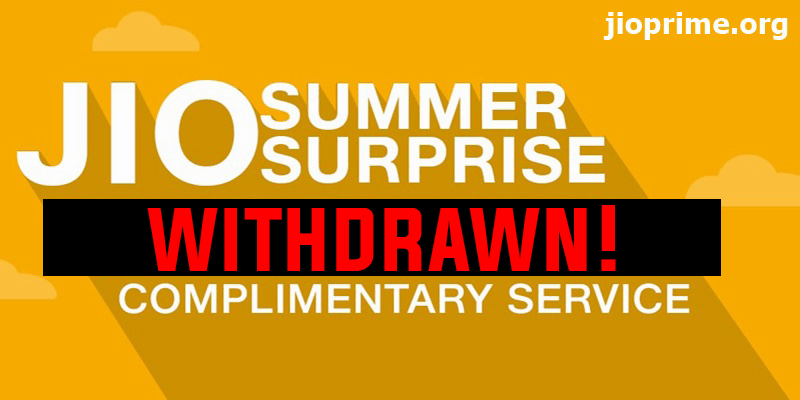 JIO SUMMER SURPRISE OFFER WITHDRAWN! BUT, WHAT’S THE CATCH? Today, the Telecom Regulatory Authority of India (TRAI) has advised Jio to withdraw the 3 months complimentary benefits of JIO SUMMER SURPRISE. Jio accepts this decision. io is in the process of fully complying with the regulator’s advice, and will be withdrawing the 3 months complimentary benefits of JIO SUMMER SURPRISE as soon as operationally feasible, over the next few days. However, all customers who have subscribed to JIO SUMMER SURPRISE offer prior to its discontinuation will remain eligible for the offer. But, Jio hasn’t yet announced the official discontinuation date of the Summer Surprise Offer, and so, this means that if you will do the recharge of Rs. 303 or above in a couple of days, you still are eligible for the Offer, and you are going to get 3 Months of Complimentary service. Jio has clearly said this and so, we will advise you to recharge immediately today or tomorrow because Jio can announce the discontinuation date in a few days. Online mobile recharge services has also started with working on to providing best discounts to people and the best paytm wallet offer is still running to provide the best services.